When I first started the Seraph Press Translation Series with co-editor Vana Manasiadis in 2016, our initial aim was to bring to New Zealand audiences fresh literature from other places and other languages. Vana had just returned to Aotearoa after living in Greece for almost a decade and she felt very strongly the loss of literature, especially poetry, from other languages. But we very quickly we realised that we also wanted to honour and recognise the indigenous language or this country. For that reason , the first two books, one translations from Greek and the other from Italian, also included a poem each translated into te reo Māori. We wanted to take it further, and have a volume of poetry written by some of the many talented Māori poets, and have their work translated into te reo. We knew there was a hunger for something like this, and we wanted to help make it happen. But we couldn’t do it alone; we needed a collaborator and guide, and we were delighted when poet/playwright/translator Maraea Rakuraku agreed to join as co-editor with Vana. The two of them selected seven Māori women poets: Anahera Gildea, Michelle Ngamoki, Tru Paraha, Kiri Piahana-Wong, Maraea Rakuraku, Dayle Takitimu, Alice Te Punga Somerville and Maraea herself, and organised for one poem from each of them to be translated. 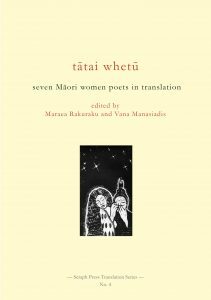 The result is Tātai Whetū: Seven Māori Women poets in Translation, a small, hand-bound bilingual volume, which presents the poems in English and te reo on facing pages. It isn’t a large book, but it feels like the seed of something, and it has definitely been finding an enthusiastic audience – we’ve already had to reprint several times. 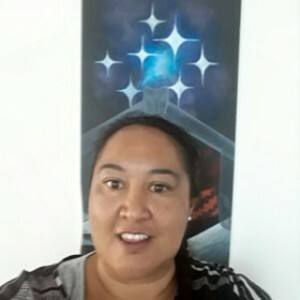 These two poems are by Michelle Ngamoki (Te-Whānau-ā-Apanui and Ngāti Porou) and Dayle Takitimu (Te-Whānau-ā-Apanui), both poets based in Gisborne. The poets explain the background to their poems below. I chose these poems because they both start with traditional Māori forms, but turn them to contemporary subjects and contemporary purposes. A living language, a living culture. You can You can find out more about Tātai Whetū on the Seraph Press website. Sister, will the land still remember You? beneath the drumming of the waves. as her pandanus cloak is pulled aside. Her taro soaked in bitter brine. in the current of your voice. as She felt your many mothers’. Will she know your name. E te tuakana, ka maumahara rānei te whenua ki a Koe? i runga ake i te tai pari. i raro iho i te hāmama a ngā ngaru. i tōna kaitaka e kumea ana ki rahaki. haruwai ana Tana taro i te wai tote. i te au o tōu reo. Pērā i tāna i rongo ai i ō whaea huhua. Ka hoki mai anō ia. Ka mōhio ia ki tōu ingoa. This poem was written in acknowledgment of our pacific brothers and sisters affected by climate change. The rising waters are swallowing their way of life and essentially drowning the voice that is uniquely theirs. This poem was written in the form of an ancient chant; I wrote it for my dear cousin , Keriana Barbarich, who is like a sister to me, who had suffered a major stroke and her life hung in the balance while the doctors prepared us for the worst. In our indigenous worldview she occupied the space between the living realm and the world of the ancestors. It is a known realm, and one we consider people can move through at will. Medically she was in a coma. We knew our ancestors were looking after her, but as time went on we were unsure she could find her way back to us. The chant is a call to her, to call her spirit back into her physical body and remind her of the pathway back to life. It talks of her ancient interconnection, of her sacredness and of the unique purpose she has amongst us. Despite dire odds our relation made her way back to health, and is on the pathway back to recovery. Our collective faith in her ability to heal never wavered. 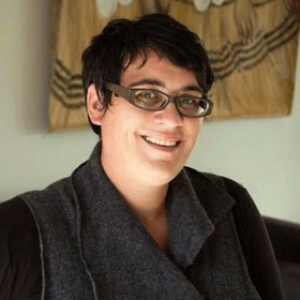 Helen Rickerby is the founder and Managing Editor of Seraph Press, a boutique publisher based in Wellington that publishes high-quality literature, mainly poetry. She is also poet – her most recent collection, Cinema, was published in 2014 and her next collection, How to Live, is forthcoming from Auckland University Press later this year.